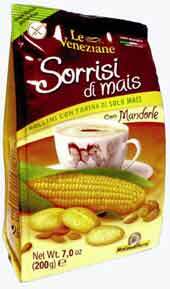 legumes, biscuits, candies and powders. 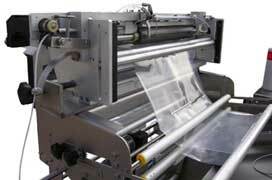 lap seal for plain polyethylene film. 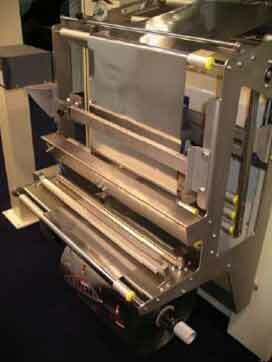 FILM UNWINDING UNIT, composed of a structure entirely in stainless steel Aisi 304 , shaft with expansion blades. It is provided with a motorized adjustment for a prompt and easy adjustment of the film horizontal centring with respect to the forming set and a quick splicing unit, which eases and minimizes the required time for joining the film and replacing the reel. The reel holder and breaking unit are provided with roll end detector. 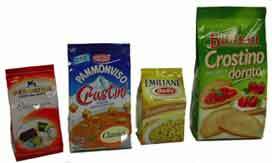 It is provided with devices for the film compensation, necessary when the encoder or the photocell are used to obtain a rapid centering either of the stamping on the film or of the code print on the bags. Encoder is set as close as possible to the collar of the forming tube, in order to always grant the best accuracy in the cut length. PULLING BELTS, driven and controlled by A/C motor with its inverter. The positioning with relative pressure of the belts against the forming tube occurs by means of D/C motors through the touch screen, with adjustable pressure and sensor for avoiding excess of pressure against the forming tube. The driving belts are directly driven, without articulate joints and without hidden, overlapped or hollowed components, designed and featured to be easily cleaned and sanitized, with specific meaning to avoid any possibility of stagnation and proliferation of germs and bacteria. The replacement of the driving belts has been designed to be direct, without dismantling any component. VERTICAL SEALING JAW ASSEMBLY, composed of a fix arm sliding through linear bearings, with easy lock by means of a knob. The centering of the vertical arm is granted by a graded plate, easily readable. The motion is granted by a pneumatic cylinder SMC (METAL ON METAL). The distance of the sealing bar from the forming tube is adjustable by means of a knob. HORIZONTAL SEALINGJAW ASSEMBLY set on plates made of stainless steel AISI 304 and sliding through eight linear bearings ( four for each sealing jaw) Featured for the easiest and most efficient cleaning and sanitation operations. The sealing bars, made in hard steel C 54, are provided with a particular device for removing, replacing or cleaning and re-setting the knife after operation without tools. The motion occurs by means of a SERVO MOTOR. SEALING JAWS TEMPERATURE CONTROL: exclusive and highly efficient system for the sealing jaws temperature control by means of which resistors power is being reduced or increased in proportion to the approach of the temperature at the set value. The wave of the temperature is always in a very narrow range of ± 3 º C.
PHOTOCELL for film centering, complete with supports and electric connection to the packaging machine. AUTOMATIC FILM TRACKING SYSTEM by means of optical fibres which controls and eventually adjust automatically the position of the film respect to the center of the forming tube by moving the entire film unwinding unit through a DC motor. ELECTRIC PANEL made in stainless steel Aisi 316, protection grade IP 67, containing all the electro-mechanical components, the Programmable Logic Controller (PLC) OMRON and all the electric and electronic equipment, opening on hinges made of stainless steel, especially designed to avoid the stagnation and the proliferation of germs and bacteria. CONTROL PANEL touch screen type, set on the side of the electrical panel cabinet. The screen allows the operator to set and visualize all the various machine operating parameters: timings, speed, sealing jaws temperature, bag counters and many more functions. It also has the function of an alarm message display unit, providing information on the operating conditions of the machine and on any malfunctions; for example, it can display the piece counter, indicate absence of pressure, presence of film broken, etc. The electric system is set, in its standard configuration, to accept various accessories: photocell, printer, etc. and the interface with the multihued weigher. 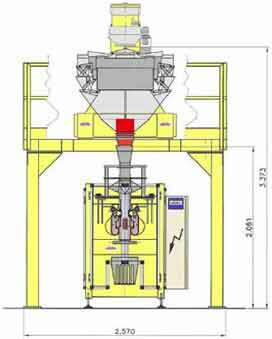 doser (bucket or auger model). Operator interface touch-screen type color panel. mechanical adjust in order to easy change reel. Speed and cycle control in phase. Longitudinal and transversal sealing by hot bar type. pneumatic system or brushless motor. Device for making euro slot or euro hole bags. Device for making bellows bags. Device for making flat bottom bags with fin. Device for coupling with clipping machine. Devices for making 4-side seal bags. 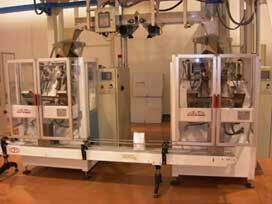 SVMA Stiavelli Dual VFFS machines. 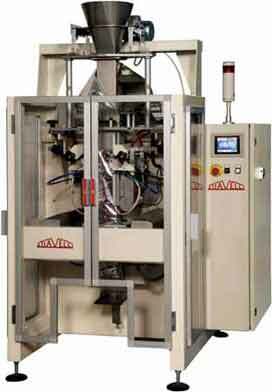 SVMA Stiavelli VFFS bagging machine. SVMA Stiavelli VFFS product samples. SVMA Stiavelli VFFS film tracking. 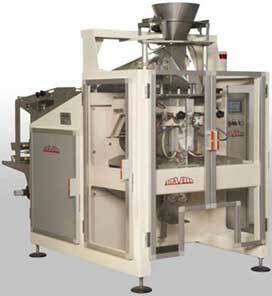 SVMA Stiavelli VFFS with Multihead Combination Weighers.